Politicians are calling for President Donald Trump's star on the Hollywood Walk of Fame to be removed after it was recently vandalized. The City Council voted, and the mayor posted on Twitter that they passed the resolution requesting that the chamber remove the star. Duran used the hashtags "#horcruxdestroyed," "#bellicose," "#belligerent," "#unAmericanvalues" and "#MakeAmericaintoAmericaAgain." The decision will ultimately be up to the Hollywood Chamber of Commerce. The chamber has never removed a marker from the Walk of Fame and turned down a 2015 request to remove comedian Bill Cosby's star. Trump was honored with his star back in 2007, when he was hosting NBC's "The Apprentice." 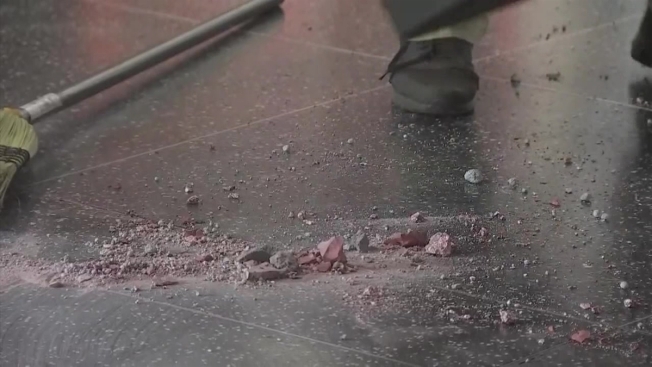 In regard to the most recent vandalism, a Glendale man accused of smashing Trump's star on the Hollywood Walk of Fame with a pickaxe was charged Monday with felony vandalism. Austin Mikel Clay, 24, is set to be arraigned downtown Aug. 15. If convicted as charged, he could face up to three years in jail, according to the Los Angeles County District Attorney's Office. At about 3:30 a.m. July 25, police were alerted to the vandalism on Hollywood Boulevard near Highland Avenue. After bashing through the plaque, the man called police and advised he had vandalized Trump's star, the Los Angeles Times reported. He said, "See you soon," before leaving the scene, Lt. Karen Leong of the Los Angeles Police Department's Hollywood Division told the newspaper. About an hour later, officials say he walked up to Beverly Hills police headquarters, identified himself and said he wanted to turn himself in. It was the second time Trump's star has been vandalized in less than two years. In October 2016 a man dressed as a construction worker smashed the star with a pickaxe and sledgehammer. James Otis pleaded no contest to felony vandalism in February 2017 and was sentenced to three years probation, 20 days of community service and agreed to pay $4,400 for the damage. "The Hollywood Walk of Fame is an institution celebrating the positive contributions of the inductees," said president and CEO Leron Gubler. "When people are unhappy with one of our honorees, we would hope that they would project their anger in more positive ways than to vandalize a California State landmark. Our democracy is based on respect for the law. People can make a difference by voting and not destroying public property." Trump's star is currently boarded over.